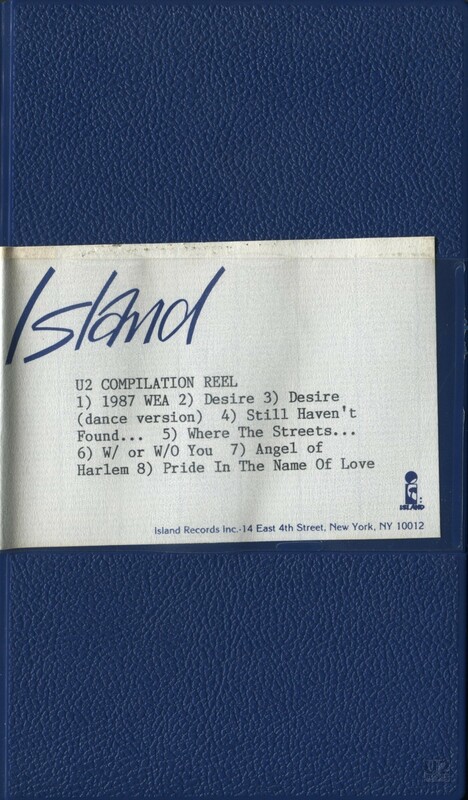 This compilation VHS promo was sent out by WEA and Island Records at the end of 1988 to celebrate the success of U2 and to highlight their contribution to the WEA family and the related labels associated with WEA. The video opens with U2 dressed as gangsters, and speaking about the success of the album, The Joshua Tree and WEA and the various labels. The footage includes a short clip of “Babyface” Mullen playing the violin. The entire clip is about 90 seconds in length. The video then goes into the promotional videos for most of U2’s hits at that time. It starts with “Desire”. Although the front cover and the label both say that “Desire (Dance Version)” is included it is not present on this VHS compilation. After “Desire” is the traditional version of “I Still Haven’t Found What I’m Looking For”. That is followed by the shorter version of “Where the Streets Have No Name” which opens with scenes from the air of LA, including a sun rising above the clouds. The version of “With or Without You” here is not the more common version by Avis, but is the Mahurin one instead. “Angel of Harlem” is the next song. The final video is the colour version of “Pride” filmed by director Donald Cammel. At the end of the video, the footage returns briefly to the WEA promo at the start, and we see another couple of seconds of Bono in mobster persona. The footage used here is also in the initial clip.